A systematic review and economic evaluation was commissioned to determine the effectiveness and cost-effectiveness of bariatric surgery for mild [class I, body mass index (BMI) 30 to 34.99] or moderate (class II, BMI 35 to 39.99) obesity. We searched 17 electronic resources (to February 2010) and other sources. Studies meeting predefined criteria were identified, data-extracted and assessed for risk of bias using standard methodology. A model was developed to estimate cost-effectiveness. Two RCTs were included. 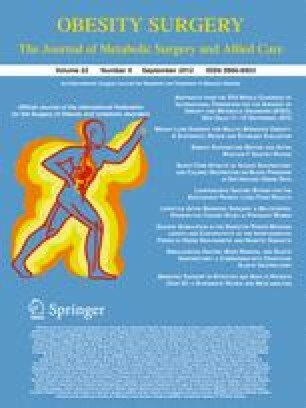 Evidence from both indicated a statistically significant benefit from laparoscopic adjustable banding (LAGB) compared to a non-surgical comparator for weight loss and in obesity-related comorbidity. Both interventions were associated with adverse events. LAGB costs more than non-surgical management. For people with class I or II obesity and type 2 diabetes (T2D), the incremental cost-effectiveness ratio (ICER) at 2 years is £20,159, reducing to £4,969 at 5 years and £1,634 at 20 years. Resolution of T2D makes the greatest contribution to this reduction. In people with class I obesity, the ICER is £63,156 at 2 years, £17,158 at 5 years, and £13,701 at 20 years. Cost-effectiveness results are particularly sensitive to utility gain from reduction in BMI, factors associated with poorer surgical performance and diabetes health state costs. Bariatric surgery appears to be a clinically effective and cost-effective intervention for people with class I or II obesity who also have T2D but is less likely to be cost-effective for people with class I obesity. This manuscript updates research conducted as part of a project funded by the NIHR Health Technology Assessment programme (project number 08/06/01) which was published in Health Technology Assessment 2009; Vol. 13, No. 41, and as a Cochrane review ‘Surgery for obesity’ 2009. Department of Health. Health risk and costs of obesity. 2007. http://www.dh.gov.uk/en/Publichealth/Healthimprovement/Obesity/DH_4133949. Accessed 3 March 2009. Colquitt J, Clegg A, Loveman E, et al. Surgery for morbid obesity. Cochrane Database Syst Rev. 2005; Issue 4. Art. No.:CD003641. doi: 10.1002/14651858.CD003641.pub2.